Italian Prime Minister Silvio Berlusconi has caused a fresh political controversy by reportedly describing former Fascist dictator Benito Mussolini as a benevolent leader who had no blood on his hands. The remarks reportedly came when Mr Berlusconi was comparing Mussolini and Iraq's deposed president Saddam Hussein in an interview with journalists from Britain's Spectator magazine and Italy's Voce di Rimini newspaper. "Mussolini never killed anyone. Mussolini used to send people on vacation in internal exile," Mr Berlusconi was quoted as saying by Voce di Rimini newspaper. Italy's Jewish community has expressed outrage at the comments, and opposition centre-left parties demanded an immediate apology from the prime minister. "Berlusconi's comments cause me profound pain," Amos Luzzatto, the President of Italy's Jewish community, was quoted as saying by Reuters news agency. In an apparent attempt to calm down the row, Mr Berlusconi later said he "never meant to re-evaluate Mussolini". "Stop with these exploitations," he said after talks with Egyptian President Hosni Mubarak in Rome. The latest row follows a long line of controversies sparked by often outspoken Mr Berlusconi, who is also the acting president of the European Union. Earlier this year, he triggered a diplomatic storm after comparing a German lawmaker in the European parliament to a Nazi concentration camp guard. 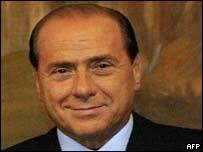 And, last week, Mr Berlusconi reportedly accused Italian judges of being "mentally disturbed". Benito Mussolini ruled Italy from 1922 to 1943, when he was ousted from power. Historians say that wide persecution of Jews began in 1938, when Mussolini introduced Italy's first anti-Semitic laws, opening the way for the eventual deportation of about 7,000 Jews. It is believed that some 5,910 of them were killed.